QualStaff Resources has achieved this milestone through the hard work and dedication of our employees, an exceptional service delivery process, and our culture of customer service that exists throughout the entire organization. 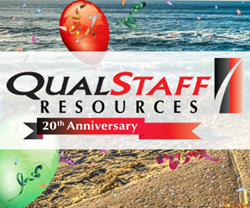 QualStaff Resources is proud to announce its 20th year as a premium supplier of recruitment services in the greater San Diego, California area. QualStaff Resources has grown from a small start-up company to one of the top recruitment firms in San Diego providing highly in-demand talent for Fortune 1000 companies. QualStaff Resources was founded in San Diego in 1998. Among the company’s service offerings are providing talent for the following hiring needs: Temporary/Contract, Temp-to-Perm, Professional Search, Payroll Services and Partnering Services.